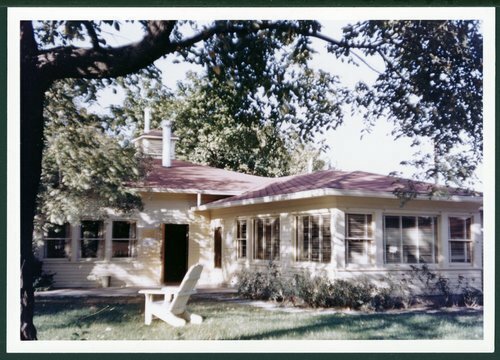 This colored photograph shows the Arts and Craft Building in the Summer of 1954. It later became the Southeast Office. In 1925, the Menninger Sanitarium Corporation purchased a farmhouse on the west edge of Topeka, Kansas. The farmhouse became the inpatient clinic and the surrounding 20 acres were developed with buildings and gardens to become the "East Campus" of the Menninger Foundation. This was one of the nearby houses purchased and then converted for several different uses. In 1982, the "West Campus", a much larger area, was developed west of Topeka, a residential scale community of 28 structures on a 350 acre hilltop campus. In 2003, the Menninger Foundation was moved to Houston, Texas.